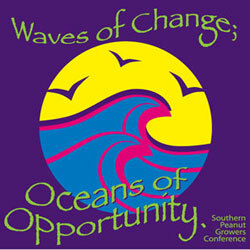 The SPGC blog is ready for the 14th Annual Southern Peanut Growers Conference being held July 19-21, once again at the Edgewater Beach Resort, Panama City Beach, Fla. This will be the 5th year that the annual conference of peanut growers from Alabama, Florida, Georgia and Mississippi will be covered start to finish on this blog in photos, audio and video. The three-day event provides farmers an opportunity to learn more about the industry and issues affecting them while also enjoying a relaxing time at the beach. This year’s conference general sessions provide farmers with information on how the peanut industry is helping fight world hunger, legislative updates, uncontrollable costs on the farm and peanut research. In addition to the conference sessions the event focuses on the family by offering a ladies program and a golf tournament. See the full agenda here. The legislative update will be of particular interest this year with Congress in the midst of negotiating a new farm bill and one of the major players in the process will be attending SPGC. House Agriculture Committee chairman Frank Lucas (R-OK) will be able to enlighten conference goers on the current status of farm legislation and what happens next. The list of sponsors for the conference has grown this year. All the same ones from last year have returned and new folks will be joining us. Please check out the sponsorship listing at the right and be sure to thank those companies for their support. All the info about the conference can be found here – including registration, if you have not done so yet. Hope to see you in Panama City!